The farm kid from the windy plains moves to the Windy City! I feel like the country mouse that went to the city. I am currently a senior at Dordt College in Sioux Center, Iowa. Dordt has given me many different opportunities, including this pretty great one in Chicago! I’ve grown up living and working on the family farm in rural Iowa. It makes sense that I am majoring in Agriculture Business at Dordt. This is what has given me the label of “fresh off the farm” from some of my peers in the Chicago Semester program. I wear the label with pride. Mitch on the Trading Floor. 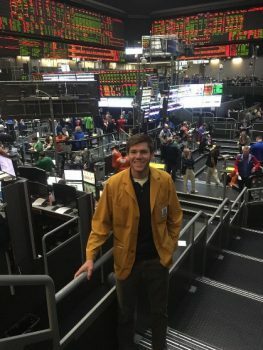 This semester, I am interning at A&A Trading Inc., which is a fantastic opportunity. A&A is a commodity trading brokerage that works directly on the Chicago Mercantile Exchange (Chicago Board of Trade). The Chicago Mercantile Exchange is a futures commodity exchange which determines what the futures prices are, as well as the cash prices of different commodities such as corn, soybeans, cattle, and hogs. Growing up in rural, agriculturally focused Iowa, I always heard things along the lines of, “what are those guys in Chicago thinking? !” when the prices of certain commodities would fluctuate. Well, now I am one of those crazy guys in Chicago! My internship has been pretty great. My supervisors and coworkers have been incredibly good to me. They have helped me to better understand different markets, how they work, and what is affecting the pricing and supply and demand of those markets. Living in the city has been pretty great as well. I grew up in the country, the nearest town to my home has a population of about 700, and so as you can imagine this is a pretty big change for me. Despite missing the stars at night, I have really grown to love living in the big city of Chicago. There is always something going on! Every weekend there are different festivals, sports games, and did I mention we live three blocks away from the beach? What could be better for a land-locked Iowan? Last week, I went to the taco festival with some other Chicago Semester students, how cool is that? An entire festival for Tacos! I have also had the opportunity to make it to some sporting events such as a Cubs game, and Northwestern Football games. Each Wednesday is class day (we intern on Monday, Tuesday, Thursday and Friday). I am taking three classes this semester: Arts and the City, Professional Workplace Seminar, and Diversity and Inequality. For my Arts and the City class, we attend a different art event each week. We have attended two different theatre events, the Chicago Art Institute, and a dance performance. I’m not exactly an art person, but I have really enjoyed getting to experience these events and better understand art and the way it affects people and the culture of the city. My Diversity and Inequality class is also super interesting. We have been studying the different neighborhoods in Chicago and how these neighborhoods each have different cultures and backgrounds. Through this class we have toured quite a few different neighborhoods including Chinatown and Pilsen (which is a Hispanic neighborhood). I have really enjoyed checking out these different neighborhoods and learning more about them and their history! As you can probably tell, I am loving my semester in the city! I’m looking forward to what the remainder of the semester will bring.